Senate president bukola saraki led eight senate is the most oppressive, tyrannical, despotic senate in the history of Nigeria. His miniature senate is the most regressive of all senate. When he entered into an alliance with opposition party to emerge senate president as against his party's choice, I knew he was going for the jugular. The Senate under saraki is anti dissent view in a country that practices the same democracy with the United States of America and other developed and democratic nations. The insinuations by some people who terms our democracy as fledging or nascent to warrant all this shenanigans is most irresponsible and inaccurate. 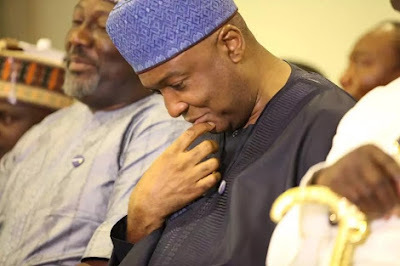 The eight senate under saraki is now a ghost area as most ranking and old senators find it difficult to talk at the plenary because of saraki's infantile attitude. The senators who turns the plenary to a comedy arena are either having exuberance attitude or are using the Senate to display stupidity. The United States of America senate is a typical example where dissents take their leadership to the cleaners without being suspended or call to order. It is a senate where Human Rights are entrenched and various voices are allowed to ventilate their grievances. Senator John McCain is a ranking senator, he openly go against it's leadership under McConnell, the leader of the Senate and a republican. During the debate to repeal Obama care proposed by president Donald J Trump , senator John McCain has just undergone heart surgery, he appealed to be discharged In order to be part of the debate and the passage. When he was allowed to speak on the floor, he lampooned his president for considering the change of Obama care, he did not end there, he chastised his party and it's senate leadership,considering the fact that his party has the majority in the Senate, his vote and another republican senator vote killed the bill. He was not suspended by the senate under the leadership of his party. I wonder if senator John McCain was to be a senator in Nigeria and under the leadership of bukola saraki, what would have become of him. Senator saraki allows for dissenting voices to lash out at the president and the leader of his party, but does not give room for senators who have affinity to the president to talk in his defense or favour. The suspension of senator Omo Agege representing Delta central for expressing his views on election sequence was a joke taking too far and a legislative recklessness. The Senate under saraki has not purged itself of impunity and rascality. He is currently before the Supreme Court to entrench his fundamental human right but he is depriving another senator to demand for his right. There is a subsisting judgement delivered by federal hight court Abuja on the legality of the Senate to suspend a senator. According to the judge who gave a judgement in a case brought before it by senator Alli ndume who also suffered saraki's high handedness and sledge hammer, the judge ruled that, you cannot suspend a member of the national assembly for more than 14 legislative days and that you will deprive his constituency representation if he is suspended for that long period. He ordered the recall of senator Alli ndume and directed that all his allowances for the six months that he was suspended be paid. The judgment is yet to be appealed by the saraki led Janjaweed senate. It simply means that any other suspension more than 14 days is ultra vires and should serve as a guide moving forward. So, the suspension of Omo Agege is simply a witch-hunt orchestrated by the cantankerous bukola saraki who sees himself as a lord that must not be challenged in an archaic environment. I will implore the old senators like David mark, Barnabas gemade, Sola adeyeye, Francis Alimekhena and others to call saraki to order, and let him be mature in handling dissenting views which is the hallmark of democracy.